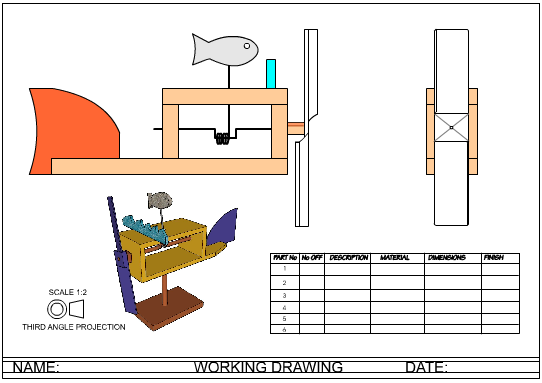 You are to draw an accurate working drawing of the wind powered device shown below or your own design. This will consist of a front and a side view. The plan view is not necessary as there is enough detail in the other two views to manufacture the model. You also need to attempt a three dimensional drawing, including colour and shade. Part of a working drawing has been started below. Complete an accurate working drawing of your wind powered device. This will consist of a front and a side view. A sample answer is seen below. You may wish to include dimensions and a parts list. In the parts list you need to state the basic measurements of the materials you need and the finish to be applied (paint, varnish etc...). Furthermore, you should include a symbol that clearly illustrates the style of orthographic projection you have used (Third Angle) and the scale of the drawing. 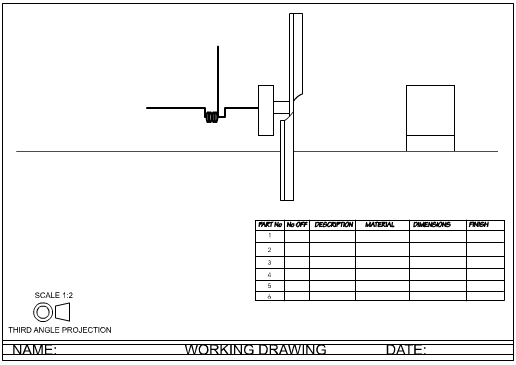 For further information on orthographic drawing / working drawings click here.